Jose Mourinho singled out Ole Gunnar Solskjaer and Ajax manager Erik ten Hag for praise following Tuesday and Wednesday’s Champions League games. Mourinho was fired as Manchester United manager last December after overseeing a series of poor results and falling out with some of his players. The Portuguese was subsequently replaced by Ole Gunnar Solskjaer in the Old Trafford dugout. Solskjaer has so far led Man United on a positive run, with the Red Devils winning 13 from 16 games under the Norwegian manager. However, the caretaker manager’s biggest result came on Tuesday when he led Man United to a 3-1 away win over PSG despite losing 2-0 at home in the first leg of the Champions League round 16 tie. Mourinho, who is currently without a club, has been working as a pundit and the Portuguese has praised his Man United successor for a “phenomenal” win over PSG in the Champions League. 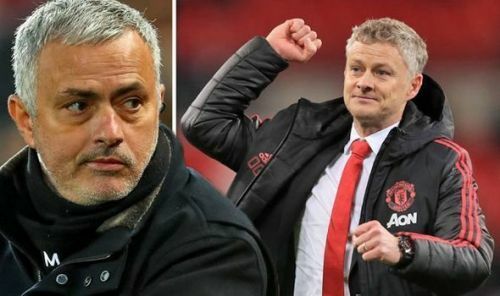 The 58-year-old singled out Solskjaer and Ajax boss Erik ten Hag – who also led the Dutch side to a 4-1 win over Real Madrid at the Bernabeu – for praises. “So for me, [Erik] ten Hag from Ajax and Solskjaer from Manchester United. Incredible results, so credit to them. Mourinho added that Man United deserved to advance to the quarter-final of the Champions League despite riding their luck and adopting a pragmatic style at the Parc des Princes. Man United and Solskjaer will travel to the Emirates to face Arsenal in a game that could be key in the race for a top-four finish. Meanwhile, Mourinho continues to be linked with a return to Real Madrid following the Blancos’ elimination from the Champions League.